Journalist Jim Lehrer speaks with Jack Censer, dean of Mason’s College of Humanities and Social Sciences. Journalist Jim Lehrer almost didn’t become a newsman, and when he did, he made mistakes. 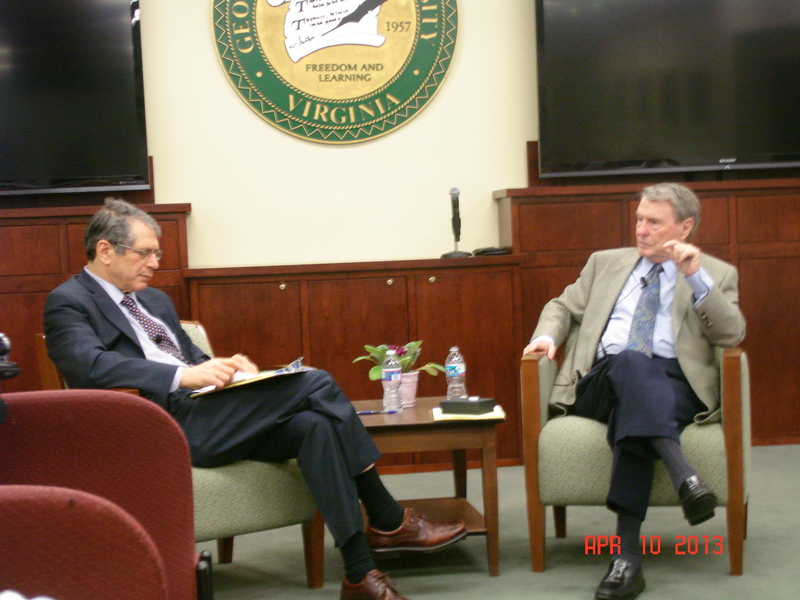 Lehrer revealed these things and others when he spoke to a multi-generational crowd in Meese Conference Room in Mason Hall Wednesday afternoon. Lehrer told the group he originally wanted to be a professional baseball player, until he met a certain someone. “I was touched by a teacher,” Lehrer said. A seventh grade teacher gave him a good mark on an essay and inspired him to pursue a career in writing, he said. “I went home that night and told my mother, ‘Mom, I’m going to be a writer,'” Lehrer said. From there, Lehrer said he overcame challenges getting into journalism school, worked long hours in the newspaper industry, and even erred when he interviewed a president. “On the day the Monica Lewinsky story broke, I had an interview scheduled with Bill Clinton,” he said. “I assumed it was not going to come off,” he said. When it did, Lehrer said he ended up getting coverage that was used by all the major television networks. The three nightly news anchors for those networks were all in Havana covering a visit by the pope, he said. With all of those viewers watching, though, Lehrer said he made a mistake. When he asked the president about his relationship with Lewinsky, Lehrer said he failed to recognize that Clinton spoke of his actions with Lewinsky in the past tense. He did not notice this at the time, he said. His daughter told him of the error after the fact, he said. “I just didn’t hear it,” Lehrer said, but said he got away with it. “I’ve never been through anything like that,” he said. In addition to sharing stories from his own career, Lehrer also offered his ideas about the future of the journalism profession. “This is the time to go into journalism,” Lehrer said. “We’ve got to have information,” he said. Journalism students may have a difficult time finding jobs. Lehrer said he recognizes that. “All of these news organizations are hungry for ideas, [though],” he said.